Come and sign with us! This is a 'Mommy/Daddy and Me' class for parents and their children 6 months through 3 years and all developmental levels. Each class teaches 6 to 10 ASL (American Sign Language) signs and vocabulary words that are most important in the life of babies and young children. Each week there is a different theme, 6 in all, such as Mealtime,Bedtime, Bath Time, etc. 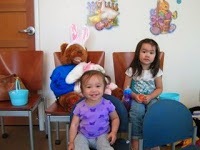 Vocabulary is taught through fun games and delightful songs with BeeBo the Baby Signs Bear. Sign, Say & Play Classes also introduce play activities that reinforce important language, cognitive and social-emotional skills while bringing families together to share their signing experiences. 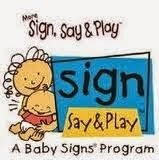 MORE Sign, Say & Play® Classes are an extension of our Sign, Say & Play® Classes for babies and their parents. These classes follow the familiar Sign, Say & Play format with fun songs, games, and activities Each class teaches 6 to 10 ASL (American Sign Language) signs and vocabulary words that are most important in the life of babies and young children. Each week there is a different theme, 6 in all. In this class we will learn 36 new signs from these important themes: Feelings, Outside, Safety, Farm, Zoo, and Birthday. 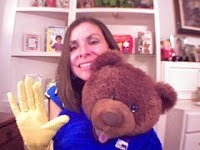 Vocabulary is taught through fun games and delightful songs with BeeBo the Baby Signs Bear. Sign, Say & Play Classes also introduce play activities that reinforce important language, cognitive and social-emotional skills while bringing families together to share their signing experiences. 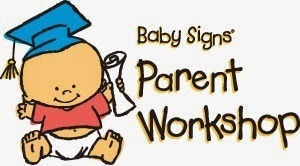 The Baby Signs® Program helps children develop both language and cognitive skills. Babies who sign are able to develop speech sooner and long-term studies show these early skills can translate into better grades. This class is geared towards adults and is recommended for expectant parents and parents and caregivers of children ages 0 to 2 ½ years or children who have difficulty communicating. Early childhood educators, parent educators, speech therapists, social workers and health specialists are also welcome to attend. Did you know that vision is, in part, a learned behavior and not the automatic ability that most of us always assumed it to be? Like learning to grasp or crawl, controlling the muscles in the eyes so that they move together or focus appropriately takes practice. This class is designed to introduce parents and babies birth to 6 months old to fun activities that promote healthy vision development. Come SEE what it is all about! Bring a comfy blanket for baby to lay on. You can also bring infant seat for baby - whatever is most comfortable way for you to sit with baby.